Local theatre group, all for One productions, produces family-friendly and thought-provoking plays seldom seen on other Fort Wayne stages. This year’s lineup of classic works and area premieres proves to be another great season of moving tales, family drama, exciting adventures and more. Unlike other theatre groups, all for One productions is unique for the area because they are a faith-based theatre organization. A typical season includes a family show, a classic adaption and a modern piece. 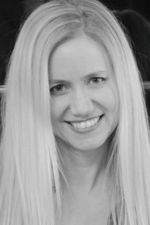 Previous seasons have included Jane Austin’s Emma, An O. Henry Christmas, The Little Princess, The Beams are Creaking, 1984, and The Princess and the Goblin. 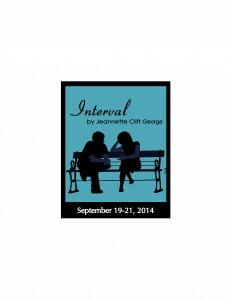 The first show this season is Jeanette Clift George’s Interval. Originally written and performed for the Houston-based Christian theatre, A.D. Players, this play for two actors is a quirky show that quickly moves from romantic comedy into murder mystery, with the actors playing a dozen different characters. The story centers on a couple whose chance encounter in a park sparks an unusual friendship. Lenore, a small town girl from Wisconsin, has just arrived in New York City and meets Alan, a straight-laced businessman waiting in Riverside Park. At first their friendship is nothing more than a friendly rendezvous, but as their relationship grows, they delve into questions of faith and doubt. After a murder in Lenore’s office, the pair is determined to find out who the murderer is. As they solve mysteries and expose hidden information, the couple reveals secrets about their own pasts. This show is one weekend only: Sep. 19-21, 2014 at the Allen County Public Library. 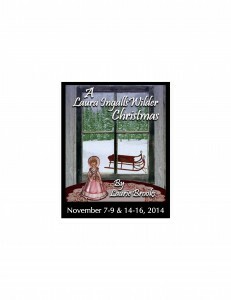 The second show of the season is the family-friendly A Laura Ingalls Wilder Christmas. Fans of the popular series will be pleased to learn that this adaptation, written by Laurie Brooks, focuses on the two years missing from the Little House books, a difficult time when Laura’s brother died and the Ingalls family ran a hotel in Burr Oak, Iowa, a job for which Charles Ingalls was not well suited. The play will open around the same time Laura Ingalls Wilder’s memoir, Pioneer Girl, will be published. Director Lauren Nichols describes it as a “charming, sweet, heartwarming play with many roles for juveniles in it.” Even though the play reveals the complexities of the Ingalls’ lives, Laura’s presence on the stage the entire show softens the view of pioneer life. This show also includes a lovely musical ensemble that will entertain the whole family. November 7-9 and 14-16, 2014. 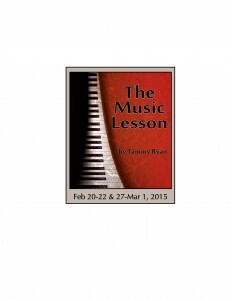 The third show of the season, Tammy Ryan’s The Music Lesson, focuses on a Bosnian family that has moved to Pittsburgh after the war to rebuild their lives. “This has been on my radar for three or four years,” director Lauren Nichols says of the award-winning play. Irena and Ivan are musicians who must take on new students in order to make ends meet, but painful memories of their past prevent Irena from taking on new student Kat, whose stubbornness is a strong contrast to the music prodigy Irena left in Sarajevo. Kat is going through her own civil war as she struggles with her parent’s divorce. Flashbacks between past and present show how cultures, music, and our relationships can teach and heal us. February 20-27, Feb. 29-March 1, 2015. 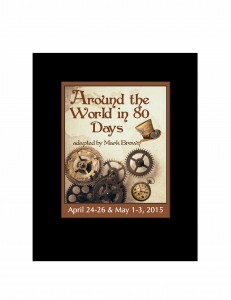 The final show of the season is the classic tale, Around the World in 80 Days, adapted by Mark Brown. Described by Lauren Nichols as “a big crowd pleaser,” she goes on to say, “Think [of the play] The 39 Steps with a better script.” Jules Verne’s classic tale involves Phileas Fogg and a wager that he can circumnavigate the world in 80 days, putting his life at risk in this grand adventure. Although the stage adaptation can’t attempt to show a “real” journey across four continents, creativity can, as trains, elephants, typhoons, and more will delight audiences in this slapstick comedy. Even more impressive, five actors play 39 characters. Jeff Salisbury will be directing this whirlwind tale that the whole family will love. April 24-26, May 1-3 2015. Check the website for performance location. Curtain call for Friday and Saturday shows is 7:30 PM. Sunday curtain time is 2:30 PM. Performances are currently held at the Allen County Public Library Auditorium. For ticket information, theatre locations, and times, please visit all for One’s website or call 260-622-4610.